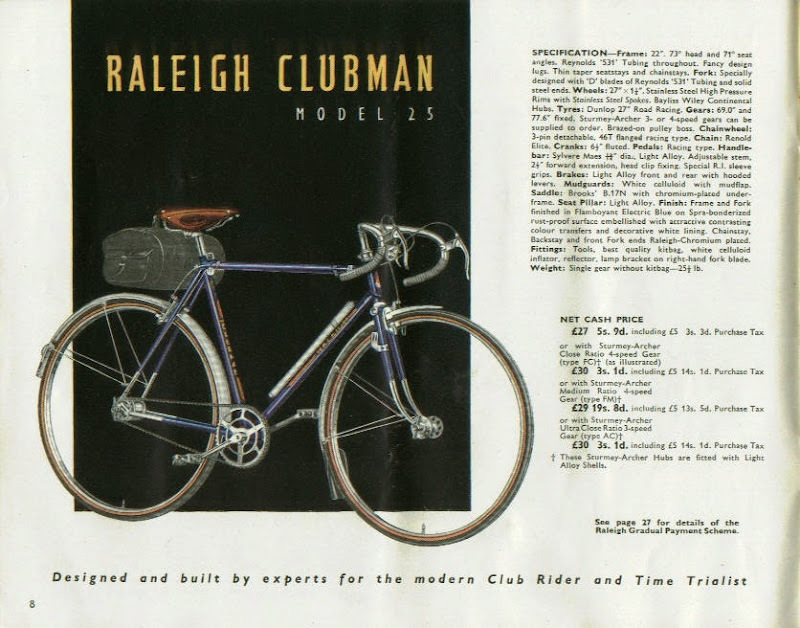 I already talked a bit about this bike on the "For the Love of Three Speeds" thread. 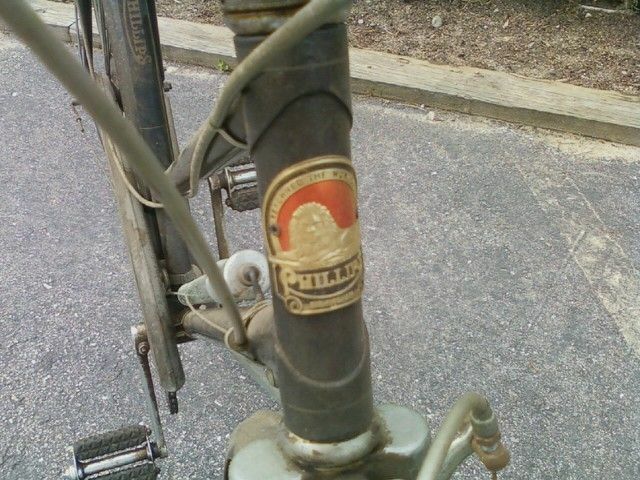 Been wanting a project and something different, so spent $100 on a 1955 Phillips 3 speed with SA Dyno-Three hub dated "55", so bike likely around that era. 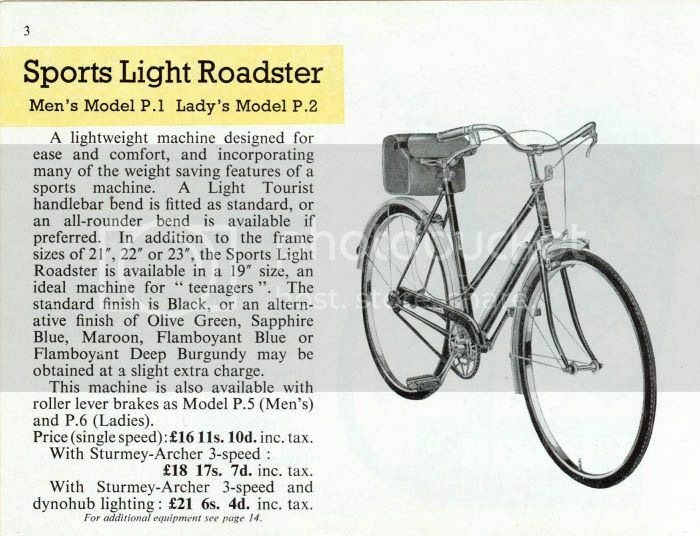 Front/rear lights work, chain has a "master link" type thing, front hub, rear hub & top of bb shell have oil ports. It's all original. Has original Phillips bell too. Strangely I didn't take the full bike photo, but it's sort of an "oxblood red" with gold lettering & stripes. Has Dunlop 26 x 1 3/8" rims and original "tyres" which say "The Silver Star Tyre....Extra Fine Quality...To Fit Rims B.S.F. 4 & EA 3" Looks like front chainring is approximately 47 teeth & rear about 18 teeth. Right brake is for the front & left brake for the rear. I tapped on the original brake pads and they actually sound like metal. Let's just say the test ride was short as bike really didn't stop me. Last edited by Velocivixen; 01-07-15 at 01:26 AM. Reason: changed some duplicate photos. I pulled the seat post out and it looks pristine, just little rust where the saddle mounts. Stem moves also. I put some penetrating oil on the cotter pins as a prelude to tomorrow's excitement. I am in posession of a Park Tool Cotter Pin Press & the mechanic who gave it to me gave me some "tips". I plan to take care of the bottom bracket & headset first. If those are in good shape, then I'll clean & replace consumables. Seller was a young guy whose friend's father passed away. He didn't know if the father rode it, but it was "in his family" and was housed in their barn outside of Portland. Very tiny amount of rust, just thick caked on grease & dust. So....feel free to impart any information, expertise or tips. Never dealt with cotter pins before. Anyone know how to get that "master link" off & what kind of link it is? What chain? By the way, chain is not stretched, but very dirty, dry & stiff. Last edited by Velocivixen; 01-07-15 at 01:28 AM. Reason: Added more photos. Nice find Vv! I've had a '52 (minus the Dynohub and lights) in my basement for the past 4 years waiting for the same treatment. A member of my church has expressed interest so I need to get busy over the winter and bring it back to life so she can take possession this Spring. Mine is black with gold details. Master Link: pretty typical style - easy to remove but also easy to poke yourself in the fingers doing it....The thin flat outer plate that looks like an extended "C" - you slightly spread the open ends apart and press the whole plate towards the closed end (and since the plate is so thin, this is where the screwdriver slips and pokes a hole in your hand). Once the closed end is moved off the link pin, the plate is rotated 90 degrees and pulled off. I usually do this by placing a suitable flat screwdriver flush with the open end and brute forcing the plate forward (not really a lot of force) - pushing will spread the arms, taking care not to hurt my hands, and it usually pops forward reasonably quickly. The other, more awkward way is to put a slightly larger flat screwdriver between the arms of the C on the inside of the pin, twist to spread the arms of the C, then with the third hand you don't have slide the clip forward. BTW - that paint looks pretty good and will likely respond extremely well to polishing and waxing. Lots of folks recommend something like Meguire's Scratch-X followed by a good waxing....first thing you can try is a good rubdown with a cloth wetted with motor oil though....careful around the decals though. Last edited by markk900; 01-07-15 at 06:28 AM. Too cool! Be prepared to get lots of attention, questions! I usually lift one side of the clip at a time off the pin on the open end, then turn the clip 90 degrees and slide toward the middle to lift off the other pin. I have done this on some chains with only my fingernail. Nice find. 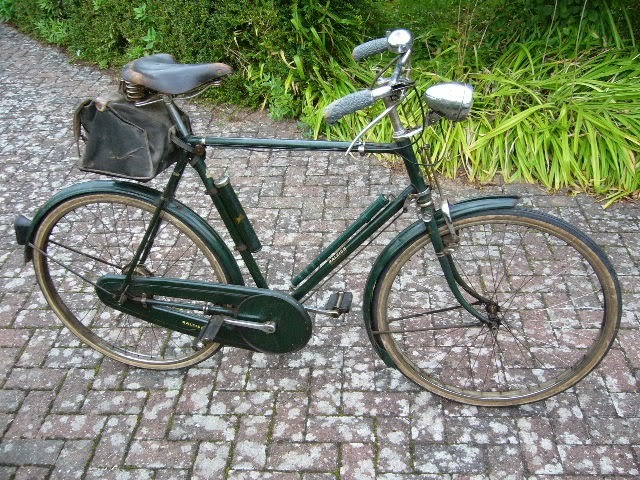 My dad has a Hercules of similar vintage that he still rides in the summer. 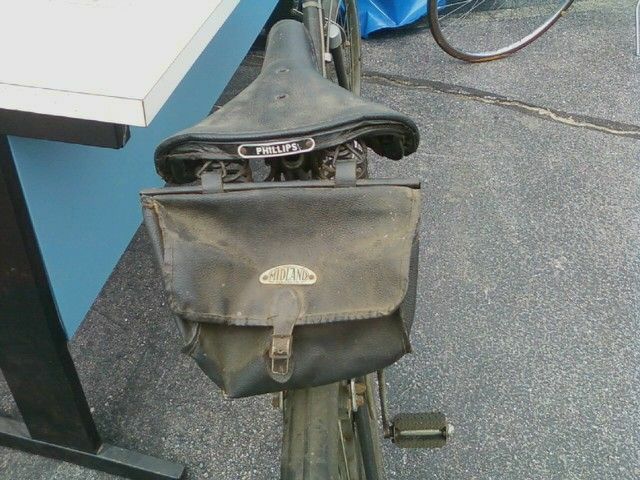 Does any one know if the bags like on pastorbob's bike are still available? Heh, you bought it. I knew you would. Surprised it lasted so long on CL in the PDX market. 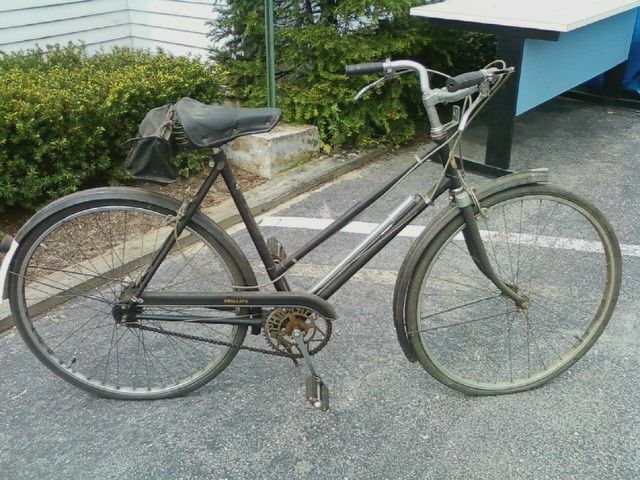 @pastorbobinnh - fantastic bicycle! The person you fix it up for will really like it. As they say, "It'll buff right out" Could you please tell me what pump it on there & take photos if you've got time? Also the grips? That saddlebag is just great too. Wonderful find for you. Maybe my post will nudge you toward the refurb. Thanks all. I'll keep you posted with the progress. Today is cottered crank day. It's been soaking in Liquid Wrench all night & I've got a cotter pin press so keep your fingers crossed. Question: Black Tires or tan walls? I know tan walled tires like the Paselas are popular on older bikes, but how far back does that trend go? Current tires are all black & think that buy using tan/black tires it will take away from the overall aesthetics of the bike. Saddle is also black, grips are RED! (Hunt-Wilde so not original) and housing is beige. So I thought to keep tires/saddle/grips all black & either reuse housing or go black. What do you all think? I've tried more colorful housing & tan/black tires on other bikes & it was too "visually messy" & distracting. Update: bent the left side cotter pin, but the right side came out easily. Removed the fixed cup, and undid the left side lock ring & adjustable cup and the entire bb is out. Got the "master link" figured out & things are cleaning up nicely. Question: That brown stuff is actually dirt that's sort of "baked on" I've soaked in oil & degreaser, but is not softening & am having to very carefully with a tiny tool, scrape it off. How to I scrape & not mess up the paint? Try using the edge of a plastic scraper or even a plastic spoon as you remove more and move closer to the paint. I also like the green Scotch pads with a generous amount of Dawn dish detergent. The Scotch pad is basically plastic fiber, so it does not tend to scratch paint, but go at it slow and carefully. You won't need to take apart the rear hub. Just drop some oil in it. Blackwall tires would be period correct. Skinwall tires came later and were not fashionable for three-speeds. I just put a set of Schwalbe Marathon 590mm tires on a 3-speed; they seem pretty nice. And I did see that Harris is once again stocking Panaracer Col de la vie tires in that size. Those are very plush. Blackballs were common, too, but definitely not the only "fashion." Happy to be corrected. Nothing to say sorry about! So what about the ball bearings in the outer part of the rear hub? Heck, I read the SA 1956 instruction manual for assembly/disassembly & was about cross eyed when done. Thinking about getting the Rubena Flash V66 tires - $15 at local place. I have another thread regarding the trials & tribulations of bent cotter pin. LBS whacked it & it came out. I believe oiling the hub in the usual way will get oil into the bearings. I don't know about the AG hub, but I know it's easy to demagnetize the front dyno hub accidentally by not following procedure. I just don't think it's necessary, and it carries some risk. I agree with Tom on this one - you will be astounded at where the oil gets to! I think right now I'd leave the hub alone with just a squirt of fresh oil and ride the bike a bit. @nlerner: thanks for the update on non-black tires - I just invested $50 in new tires for the Humber and ordered the Panaracer Col de la Vie from Niagara, along with some nice shiny CR18s. I was a little worried the tan walls might look out of place....When I first got the Humber it needed a saddle (a nice Brooks *had* to be obtained) - that doubled my investment. The new rims and tires are going to double my investment again.....but it will be worth it I hope, and it feeds the sickness. That's just a small example of what makes you awesome Tom. Velocivixen, I just wanted to say how much I have enjoyed you constantly stepping up your game with repairing/restoring bikes since you have joined BF. It's fun to see someone so open minded and with such good spirit go about learning to do all this stuff. I think we all appreciate it. Thanks you so much for the compliment. It helps to have an open minded and generous group of members here who are willing to give information, photos, divergent opinions, and just about everything. I so appreciate it. I'm torn on the tires. On one hand I want to get some decent riding tires, because if I get super cheap ones now, then end up loving the bike, making new wheels I'd want "nicer" tires, so then I'd have a inferior pair hanging around. I don't really want/need several pairs of 26 x 1 3/8" tires around. On the other hand, I don't want to buy real plush & expensive tires and come to find out that I don't really like riding the bike. If I sold it not sure I could get my money back. I figured if I got the Rubena V66 Flash or the Continental World Tour they would be somewhere middle of the road. Grips? Not leather. Preferably black. Period correct or era correct? Handlebars? Don't necessarily wanna spring for Nitto, not knowing whether or not I'll love the bike. VO Has "Tourist" bars supposed to be for English 3 speeds. Thoughts? Some "before" & "afters". Master Link chain system, spindle from bb, fixed cup. The chain even says "Made in England" as do all the other parts so far. I'm still working on that baked on brown dirt on the bb shell. Ugh....slow going.